Minister of State in the Ministry of National Security, Hon. 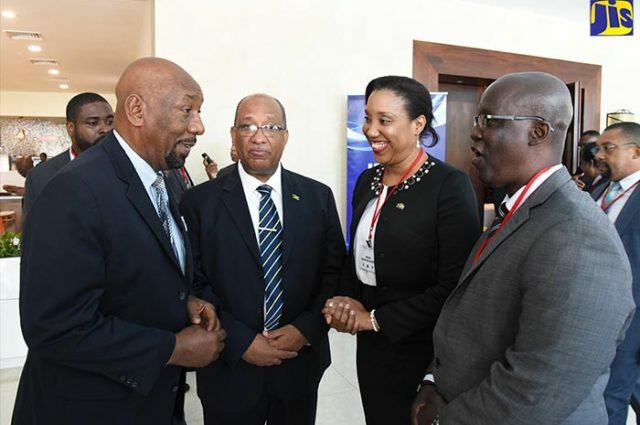 Rudyard Spencer, has called on members of the Caribbean Community (CARICOM) to collaborate more in the fight against corruption at ports in the region. “Gang warfare in the never-ending battle for control of scarce resources continues to tear apart the social fabric of our communities and countries and destroy the lives of so many of our young people,” Mr. Spencer added. He encouraged the chiefs of immigration and comptrollers of customs from the different CARICOM nations present, to continue to promote the rejection of corruption in the forms of illegal drug trade, trafficking of firearms, identity theft and data breaches, among their nationals they have employed, and citizens. “One of the most effective ways we can confront the challenges outlined is to reject corruption and the behaviours that support it. Never forget that no criminal act can bear fruit without compromise and someone deciding to look the other way,” Mr. Spencer said. He noted that hosting the CARICOM Chiefs of Immigration and Comptrollers of Customs Conference at this time in Jamaica, is “timely”. “This meeting could not have been convened at a more apt time, as there is an agreed level of urgency to collaborate across the region to confront and overcome the various existing and emerging challenges,” he said. Chair of Immigration, CARICOM, Wayne Marshall, also stated that he wants to see more partnerships taking place between the various stakeholders in the region with regard to safeguarding the ports. “We must work together on common security challenges. It not only facilitates stability in our region but it leads to safe and secure movement of people as well as goods and services. Together, we must tackle illegal cross-border activities. We must fight organised crime, including corruption, illegal migration, drug smuggling and trafficking of human beings,” Mr. Marshall said. “Only by working together can we succeed. We need to strengthen good management… where immigration, customs, police and other relevant authorities work together,” he added. The conference is being held between May 29 and 31 with the objective of bringing regional border security officials together in a forum that examines trends and to exchange best practices to enhance the regional crime and security agenda of the Caribbean in a wholesome manner. More than 60 participants from various CARICOM territories, including Jamaica, Trinidad and Tobago, Guyana, Barbados, Antigua and Barbuda, St. Kitts and Nevis, The Bahamas, Belize, Montserrat, Bermuda, British Virgin Islands, Cayman Islands, Dominica, Grenada, Haiti, Anguilla, St. Lucia, St. Vincent and the Grenadines, Suriname, and Turks and Caicos Islands, are participating. The conference is hosted by the Passport, Immigration and Citizenship Agency (PICA) and the Jamaica Customs Agency (JCA).